^^New material on divine foreknowledge and human freedom has been added as well as on Reformed epistemology. The discussions on science now cover new developments from cognitive psychology and naturalism as well as on the fine-tuning of the cosmos. The chapter on faith and reason has been expanded to include consideration of evidentialism. The problem of evil now forms its own new chapter and adds a discussion of the problem of hell. ^^The standard features remain: a survey of the field, an examination of classical arguments for God's existence, and an exploration of contemporary challenges to theism from the social sciences and philosophy as well as the natural sciences. The meaning and significance of personal religious experience, revelation and miracles--all within the realm of contemporary religious pluralism--are likewise investigated. 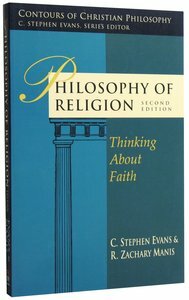 About "Philosophy of Religion (2nd Edition)"
R. Zachary Manis (Ph.D., Baylor University) is assistant professor of philosophy at Southwest Baptist University, Bolivar, Missouri. He has edited with C. Stephen Evans, Philosophy of Religion: Thinking About Faith (2nd Edition; Contours of Christian Philosophy), and is currently working on several papers, mostly pertaining to religious ethics and / or Kierkegaard's writings.